Come join the Oscar Party!! I am so excited about the Oscars this weekend. I've planned a little get-together with my friends here in Alabama complete with wine and fancy food. I want to include all of you, my blog friends, in the fun too! 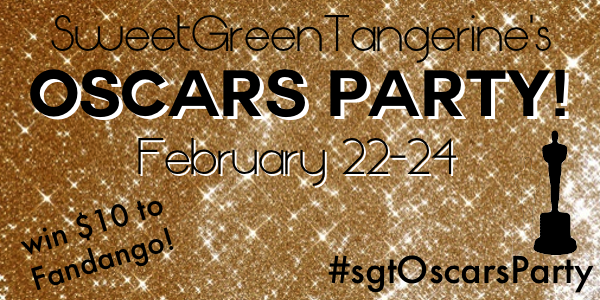 So, I'm hosting a virtual Oscars party! Then on Sunday, sit down with your closest friends or family (or go solo!) and watch the show! Show me pics of your screening party and tweet your reactions using the hashtag #sgtOscarsParty and I'll live tweet with you! Because I'm so excited about the awards and this party, I'm giving away one $10 gift certificate to Fandango! Join the party by linking up or using that hashtag and you're entered to win! I hope you join. I think this will be a lot of fun! I love this idea! You're the best! I'm really looking forward to this years ceremony.